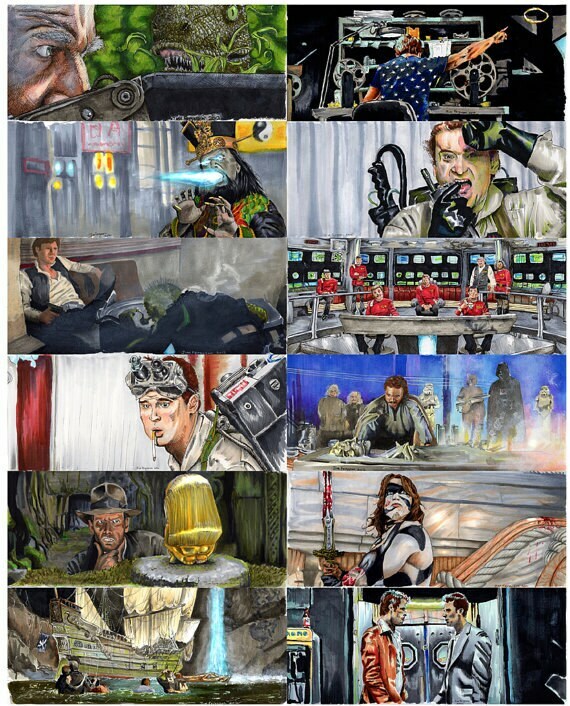 Ten 5"x11" movie scene prints for $100. From movies like Jaws, Star Wars, and many many more. Any10 Prints from the Small Print section of my shop. Just let me know which ones you will like. There was an issue with shipping, and Jim was great with taking care of it. His work was great, the prints look awesome and they were printed on thicker stock than I expected which was nice. I can't wait to see what future prints he does that I can add into the mix. Beautiful work! I love these prints-- such a great selection of movies and scenes. Will be ordering more! Love love love this artwork! I'm using these to completely fill the main wall in my office. These are some of the best movies ever made, and it's such a joy to stare at these everyday. The prints themselves are very high quality, and shipping was super-fast. These are perfect! Hands down the best Christmas present of the year! Packaged to prevent damage, delivered unscathed, and are loved by everyone who sees them! Struggling to figure out where/how to hang them because I plan on buying more! My third order. Every piece looks wonderful, always arrives quick and pristine.